Pastor Troy “No Mo’ Play in GA” We Ready - I Declare War 1999 The defining track of Troy’s career, this true classic always moves the crowd. Pastor Troy “Vice Versa” Face Off 2001 Demonstrating Troy’s versatility (“Yeah!”), this record showed that the Pastor can deliver a pew-shaking sermon (“Yeah!”) to keep the congregation’s attention while dropping knowledge (“Yeah!”). Pastor Troy “You Can’t Pimp Me” Universal Soldier 2002 Pastor Troy is no sucker artist hungry for a record deal. After all, before he signed with a major pimp, he moved 200,000 of his hoes from the truck. Pastor Troy f/ Ms. Jade “Are We Cuttin’” Universal Soldier 2002 Troy showed his versatility on this hard Timbaland track. Lil Jon f/ Pastor Troy “Throw it Up” Kings of Crunk 2002 This haunting track is the perfect backdrop for Lil Jon and Pastor Troy’s tag team. If this song comes on and you don’t get amped, check your pulse. gregation, shouting, “We ready!” “No Mo Play in GA” became a permanent staple in DJ sets throughout the South. Troy was floored when he saw professional athletes like Ray Lewis of the Baltimore Ravens using the track to get hype before a game. Master P noticed the new wave of aggression and released an answer record, “It’s On, We Ready.” The people sensed a fighter in the ropes and didn’t accept it. P used his influence and attempted to prevent DJs and radio stations from playing the record, but the people knew what they wanted to hear. “No Mo’ Play” was all over the airwaves. When all else failed, Master P forced Universal to drop their newly signed act, Pastor Troy. But just when Master P thought he had won, he learned a hard lesson: Don’t deny the people. Atlanta’s 97.5, featuring an aspiring personality named Chris Luva Luva (now Ludacris), was preparing to have their first summer jam birthday bash. Tickets flew out of the box office when Troy was announced as a performer, but fans hesitated when news began to circulate that he wasn’t going to make the show. Master P pulled one more string to replace Troy in the lineup. The night of the show, Master P was booed viciously by 30,000 people. Goodie Mob invited Troy as a special guest during their set, and the crowd exploded when they realized it was Troy standing in the limelight with his now-famous gold championship belt on his shoulder. A new king had been crowned. worked with Jazze Pha, Jermaine Dupri, Lil Wayne, Juvenile, the Ying Yang Twins, David Banner, Three 6 Mafia, Ludacris, UGK, and before Nas thought of the idea - his pops Pastor Troy, Sr. 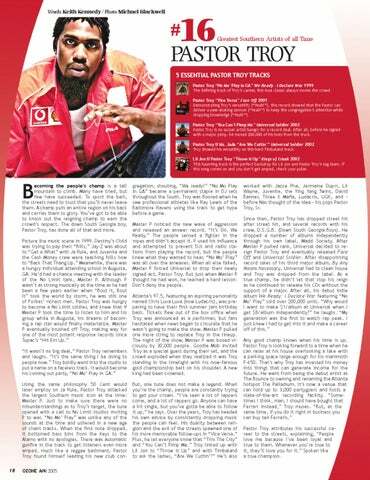 Since then, Pastor Troy has dropped street hit after street hit, and several records with his crew, D.S.G.B. (Down South Georgia Boys). He dropped a number of albums independently through his own label, Madd Society. After Master P pulled rank, Universal decided to resign Pastor Troy and eventually released Face Off and Universal Soldier. After disappointing record sales of his third major album, By Any Means Necessary, Universal had to clean house and Troy was dropped from the label. As a true champ, he didn’t let that stop his reign as he continued to release his CDs without the support of a major. After all, his debut indie album We Ready: I Declare War featuring “No Mo’ Play” sold over 200,000 units. 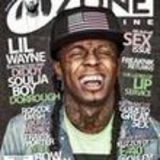 “Why would I want to make $1/album at Universal when I get $8/album independently?” he laughs. “My generation was the first to watch rap peak. I just knew I had to get into it and make a career off of this.” Any good champ knows when his time is up. Pastor Troy is looking forward to a time when he can relax at his house overlooking a lake with a parking space large enough for his mammoth F-650. That’s why Troy has invested his money into things that can generate income for the future. He went from being the debut artist at The Bounce to owning and renaming the Atlanta hotspot The Palladium. It’s now a venue that can hold up to 3,000 partygoers and hosts a state-of-the-art recording facility. “Sometimes I think, man, I should have bought that Ferrari instead,” Troy muses. “But, at the same time, if you do it right in business you can buy ten Ferraris.” Pastor Troy attributes his successful career to the streets, explaining, “People love me because I’ve been loyal and true to them. Whenever you’re true to it, they’ll love you for it.” Spoken like a true champion.